Introduced at Baselworld 2015, the Rolex Day-Date 40 watch incorporates a modernized 40mm wide version of the iconic Rolex Oyster case and a new-generation Rolex Calibre 3255 movement. The 40mm wide Oyster case has a modernized look while still maintaining the traditional Rolex Oyster monobloc construction with a screw-down back and winding crown to provide waterproofness to 100 meters. The Rolex Calibre 3255 movement continues to provide the quick-setting day and date display functions, but now extends the power reserve to approximately 70 hours. The Rolex Day-Date 40 continues the tradition of the Rolex Day-Date watch family which has been worn by so many Presidents and world leaders that it became known as the Rolex President or Rolex President's Watch. 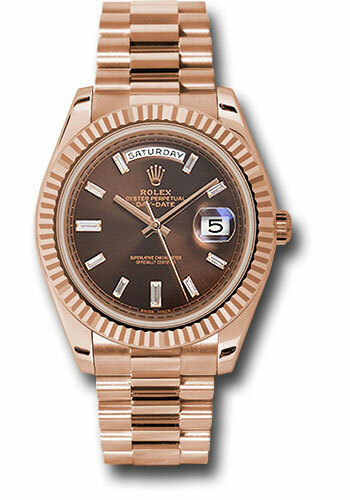 Available in Everose, yellow, and white gold versions with a fluted bezel or in 950 platinum with a smooth bezel. Each version is available with a variety of dial colors and styles with exciting new pattern motifs introduced for this Baselworld 2015 Rolex Day-Date watch.